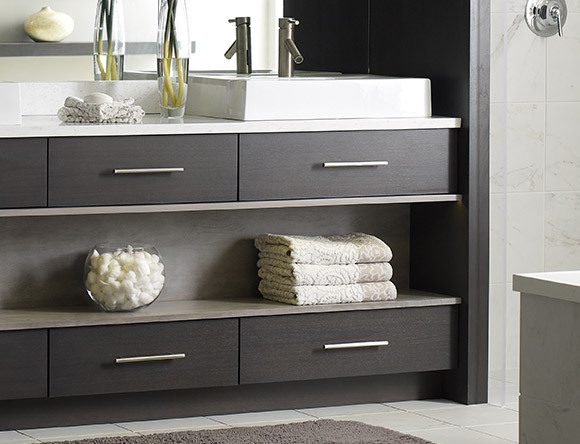 Bathroom cabinets are an important investment into the functionality and style of your new bathroom. A well-designed bathroom cabinet layout could transform your bathroom from a cluttered, overcrowded space into a beautifully functional bathroom that looks great for years to come. 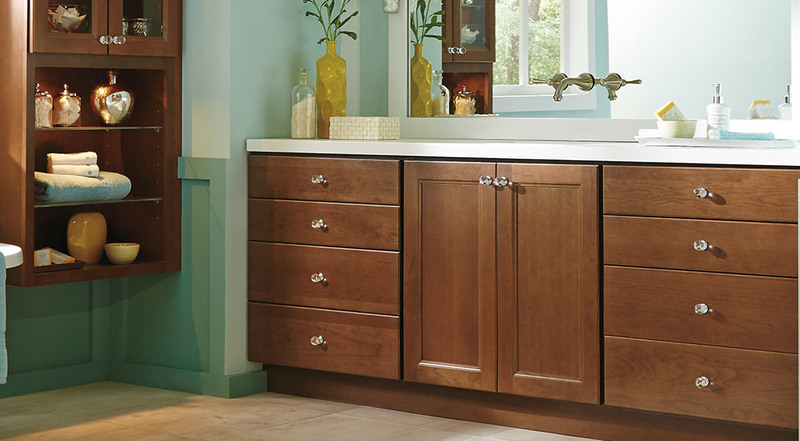 When deciding the best cabinet option for your bathroom, first determine how much space is available for the vanity. A vanity that is too large will take away too much floorspace and create problems in the overall flow and function of your space, while bathroom cabinets that are too small will not provide enough storage and look awkward in the layout. Not only should you carefully measure the best vanity width for your space, you should also consider the height of your cabinets. 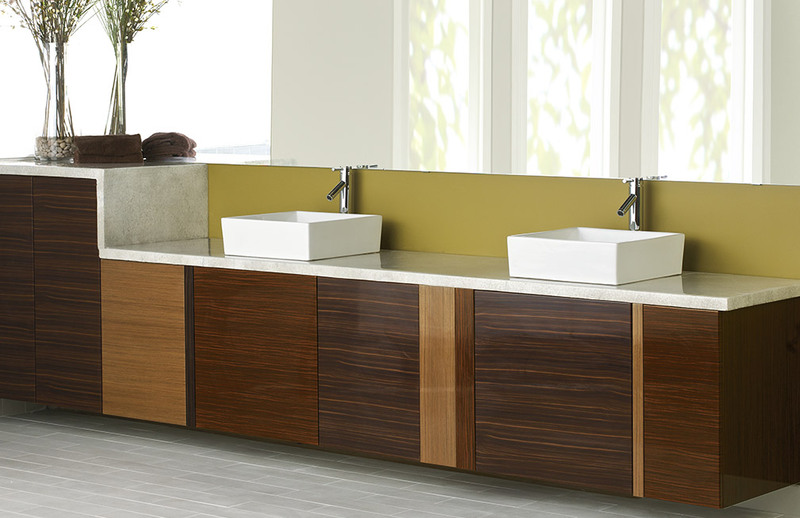 A vessel sink that sits on top of the counter requires a lower vanity to accommodate for the sink’s basin added height. However, if your bathroom is often used by elderly family members, a taller vanity will eliminate the need to bend down when completing daily washing. After measuring out the available space, you should select your cabinet’s style based on how your family’s needs and daily use. If you value a light and airy feel, a console cabinet delivers the perfect mix of drawered and open storage to prevent your space from feeling heavy. For family members with limited mobility, wall-mounted cabinets not only provide clean lines and a modern feel, but are also typically ADA compliant, so you can move around your bathroom freely and easily. If clutter is the biggest issue in your family or master bathroom, free-standing cabinets provide the maximum amount of storage for all your extra towels, products, and cleaning supplies. Finally, you should choose the material and style for your new bathroom cabinets. In a rustic, country home, reclaimed wood cabinets are the perfect option for a homey, lived-in look. 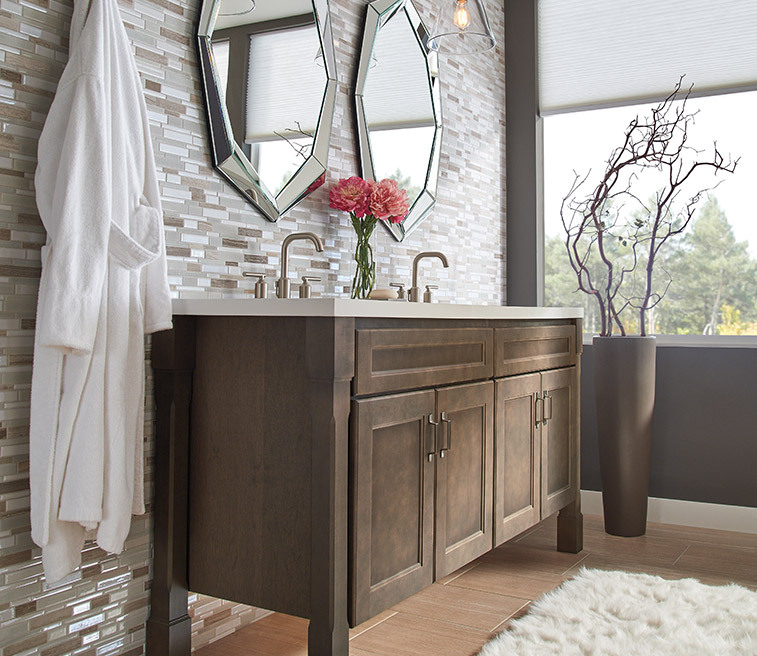 For a traditional bathroom, dark stained wood creates the perfect anchoring piece for marble countertops and tiles. If you prefer a contemporary style, white shaker-style cabinets provide a clean, fresh look that complement any modern space. While your kitchen might require more cabinetry, creating a functional and beautiful bathroom cabinet layout is equally as complicated because you need to determine how to best maximize storage in a smaller space while also accommodating for additional water and drainage issues. Therefore, hiring the experienced designers and installers at Henry Kitchen & Bath to help design your bathroom cabinet layout is essential for a creating a functional space you love to use. For exceptional craftsmanship and complete personalization, custom bathroom cabinetry is the best option for creating your perfect bathroom. With custom cabinetry, you can maximize your cabinet’s storage by adding any space-saving feature to any size cabinet. Whether you are designing for a small powder room or renovating a large master bathroom, the artisan craftsmanship of custom cabinets ensures your bathroom will function perfectly for your family for years to come. Bathroom cabinet hardware serves not only an important function but also solidifies your bathroom’s look and aesthetic. For a contemporary look, cabinet pulls offer long, clean lines, while cabinet knobs are perfect for pulling open the two large drawers under your sink. 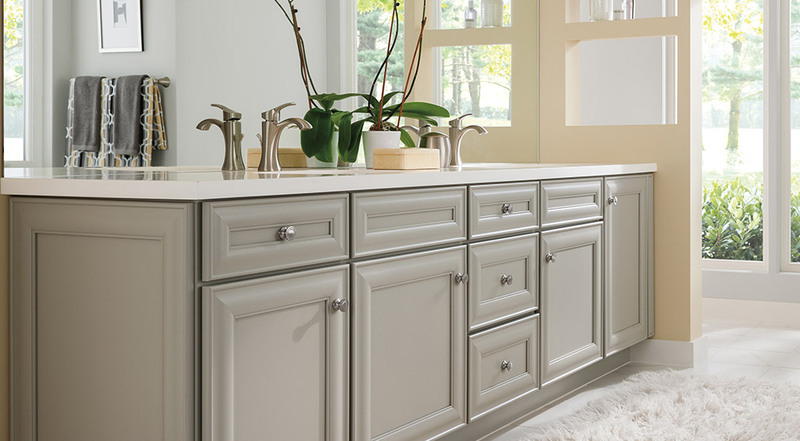 With thousands of colors, style, and brand options, Henry Kitchen & Bath has the cabinet hardware to complete any style bathroom.